Bonhoeffer – Model of Discipleship? One of the first books I bought on becoming a Christian was Dietrich Bonhoeffer’s ‘Letters and Papers from Prison’. I found myself enthralled as I watched Bonhoeffer’s theological outlook evolve as a consequence of his own harrowing experience as a vociferous opponent of the Nazi regime. His personal circumstances, upbringing, education and understanding of the church and its role in society came together to produce a radical Christocentric theology. Bonhoeffer was very much a man of action – he lived and breathed his faith every moment of every day; his discipleship was, and still is, inspirational and his prophetic witness is as relevant today as it has ever been. This has all been vividly brought to life in a Martin Doblmeier 2003 film entitled: Bonhoeffer: Pastor, Pacifist, Nazi Resister. 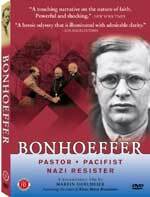 Produced by Journey Films for First Run Features (the company that has produced a number of excellent thought-provoking Christian interest films including For the Bible Tells Me So, The Power of Forgiveness and Constantine’s Sword), this portrait of Bonhoeffer is a classic and well worth watching. With interviews from Bonhoeffer’s friends, relatives and students, together with the thoughts of various theologians, Doblmeier has succeeded in producing a well-balanced and highly informative documentary that captures perfectly the essence of a man who’s influence continues to grow. Doblmeier touches on the role of certain sections of the church in acquiescing with, and indeed promoting Nazi ideology. In my opinion this is a crucial issue as it touches on the perennial question of the relationship between church and state and the ease with which the church can be influenced by societal norms and cultural conditioning. Of course Bonhoeffer saw through all of this and he was very much alert to the dangers. It is a fascinating story and although a detailed analysis was outside the scope of Doblmeier’s film, there are a couple of academic books on the subject that are well worth reading: Doris Bergen’s Twisted Cross: The German Christian Movement in the Third Reich and Susannah Heschel’s The Aryan Jesus: Christian Theologians and the Bible in Nazi Germany discuss the whole socio-political-religious milieu into which Bonhoeffer’s theology developed and his discipleship was challenged and refined. thanks for info and post! ← Whatever happened to the ‘Church Militant’?